Someone Bought This: WCW LCD wrist watch game, and flasks! - WrestleCrap - The Very Worst of Pro Wrestling! Someone Bought This: WCW LCD wrist watch game, and flasks! This WCW catalog page from the early 90’s has all sorts of stuff on it. Look! It’s one of those LCD wristwatch games! The games almost always barely playable and you could hardly see the tiny screen. but they gave you something to do during 5th Period Study Hall when you wanted to avoid doing Algebra homework. This is what we had to amuse ourselves in 1991 if we got our Game Boys confiscated by the teacher, Crappers! And yes, those are knockoffs of the WWF Wrestling Buddies. 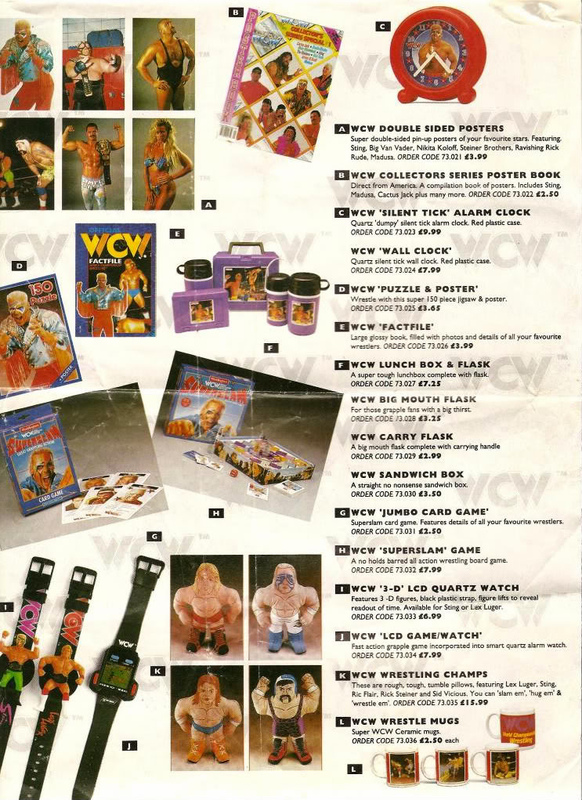 6 Responses to "Someone Bought This: WCW LCD wrist watch game, and flasks!" Still better than Herb Abhram’s UWF merch. Also, I guess we should expect a sandwich box made by a wrestling company to be “straight no nonsense” like they said. Do you have to pay to get access now? I owned that WCW FactFile once upon a time! Fun fact- it was crap! Dude I had the Sting wrestling buddy. I loved it and I don’t care. The description isn’t kidding- that is definitely a dumpy looking clock.